Nico Rosberg will start from pole for the second Russian Grand Prix after both he and teammate Lewis Hamilton abandoned their final qualifying laps. 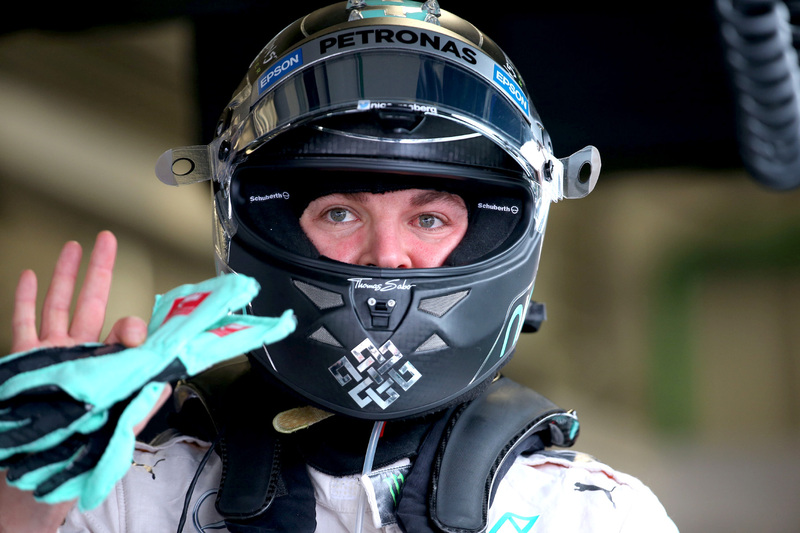 Rosberg took provisional pole after the top-ten drivers completed their first runs, coming away with ultimately permanent margin three-tenths of a second to the title leader. Hamilton was the first to throw in the towel during the second runs after he lost control of the car and ran wide, losing an unrecoverable amount of time. Rosberg, knowing his eight-tenths gap to the rest of the field wouldn’t be challenged, followed suit to claim pole. “I’m very happy,” said the German. “It’s been a difficult weekend because of the little running we got, we didn’t’ get much practice, but qualifying worked really well. Mercedes is likely to claim its second consecutive constructors championship in tomorrow’s race, needing only to outscore Ferrari by three points to put the title beyond reach. Hamilton, meanwhile, who can finish second to his teammate in every remaining race and still claim his the drivers championship, was nonplussed about losing pole. “I made a mistake,” he admitted. “It is difficult weekend for everyone. As a cheeky concluding remark, Hamilton invoked the start of the 2014 Russian Grand Prix, in which Rosberg attempted to mug Hamilton into the first corner from second on the grid, only to catastrophically lock up and neutralise his challenged. “As you saw last year, this isn’t such a bad race from P2,” he smirked. The battle for third was only just starting, however, with Valtteri Bottas claiming the clean line on the second row of the grid for Williams over Ferrari’s Sebastian Vettel. “It seems like at least today we were quite competitive,” said Bottas of the battle with the Italians. “It’s good to be third, it’s a god place to start from here. “I’m pleased with the laps and what we did as a team. Kimi Räikkönen backed up his teammate in fifth, with Force India’s Nico Rosberg keeping teammate Sergio Perez at bay in fifth and sixth by 0.04 seconds. Romain Grosjean was the sole Lotus representative in the top 10, putting his car into the eighth slot on the grid, ahead of Toro Rosso’s Max Verstappen and Red Bull Racing’s Daniel Ricciardo. The second session of qualifying was unremarkable bar the exclusion of home favourite Daniil Kvyat and Williams’ Felipe Massa. Massa’s knock-out was most shocking, with the Brazilian time 1.9 seconds slower than that logged by teammate Valtteri Bottas, who passed through to Q3. Kvyat, on the other hand, missed the cut by less than a tenth of a second, complaining via team radio that his supersoft tyres weren’t at their optimum on his fast lap. Between Kvyat in P11 and Massa in P15 qualified Felipe Nasr for Sauber, Jenson Button for McLaren, and Pastor Maldonado for Lotus. Qualifying one started with a rush of activity as teams sought to make up for the oodles of lost practice times due to rain, diesel spills, and Carlos Sainz’s mammoth crash on Saturday morning. The Williams, Lotus, and Force India along Max Verstappen all took to the track with the harder compound tyre, the soft tyre, at first, gathering data, before switching to the option compound, the supersoft, along with the rest of the field bar Mercedes. The Silver Arrows were confident enough in their inherent pace to run only the harder tyres, and their instincts proved correct when Lewis Hamilton and Nico Rosberg finished at the top of the time sheets. The McLarens and Saubers duelled to avoid an early Q1 exit, with Fernando Alonso from the former and Marcus Ericsson from the latter losing out in sixteenth and seventeenth. Alonso, racing in his 250th grand prix, will take a 25-place grid penalty in any case for taking the latest iteration Honda power unit. Will Stevens outqualified the returning Roberto Merhi in eighteenth and nineteenth. Sainz did not take part in qualifying, his crash being severe enough to require the Spaniard to be airlifted to the nearest hospital, but remains in contention to start in tomorrow’s race after being given the all-clear.